We are here to help you. If you have “how to” questions, please visit our Help & Training section here. If you have questions, please let us know. Some of our more popular questions are below. Q: Our School has a PTA. Can we use Digital PTO? A: ABSOLUTELY! Our goal is to make every parent teacher group in the country stronger, larger and bigger earners. We welcome any and all parent groups, regardless of affiliation or acronym. 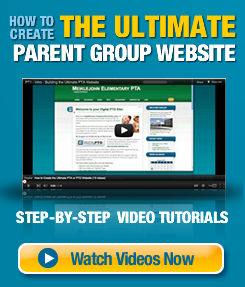 If you are a parent teacher group working on making a school (public or private!) better for our kids, then you are very welcome! Q: How is Digital PTO Priced? Q: Can I install Digital PTO on my own server? A: No. Digital PTO is only available as a part of our hosted service. This allows you to constantly have the most updated technology and features without any installation or effort on your part. You are able to use your own domain name for additional customization when you subscribe to most paid plans. Q: What happens if something goes wrong?? A: Paid Plan members have “direct access” support email built right into their site. Free Plan members have access to our User Forums for assistance. We also offer extensive training and support materials. Q: Who owns the content I upload to my site? A: You (as the uploader) are responsible for and the owner of all materials uploaded to your website. Digital PTO reserves the right to remove content deemed inappropriate by our quality control board. Q: What will my PTO’s URL be? A: All Digital PTO websites have the same URL structure. By default, your website address will be YourSchool.DigitalPTO.com. We also offer custom domain name capabilities to our Premium Members. A: YES! You are more than welcome to assign a custom domain name to your Digital PTO website. This option is available to all active Premium Plan members. Please note that you will need to have the ability to add a DNS “A” name to your domain name. Please check with your registrar to verify their specific procedure to grant access. Q: Are you affiliated with the National PTA? A: No, we are not affiliated with the National PTA. We are a private company dedicated to helping all parent groups, regardless of affiliation, start websites quickly and with little to no cost. We support the efforts of the PTA (as well as all other Parent Groups) and have been sponsors of many state and local PTA groups. Q: I have a group that is not a Parent Group. Can we use Digital PTO? A: At this time we are only allowing School Parent Group’s (PTA’s, PTO’s, PTT’s, PTG’s) to join Digital PTO. We are also now allowing kids sports and after school organizations to start sites as long as they are for a specific group and not only for marketing your programs. We have plans to expand the service in the future. If you would like to see Digital PTO expand into another field, please let us know! Q: What kind of Training do you offer new users? Q: My School District offers website space to our group. Why should we use Digital PTO? A: The websites that school districts sometimes provide for Parent Groups are extremely outdated technology for the most part and typically are not very effective. We have seen traffic increase by up to 1000% on group websites that have switched from “free district websites” to Digital PTO websites. In addition to antiquated technology, Digital PTO supports your website, keeps it up to date and secure and provides you with tools that no other service (free or paid!) can offer. Digital PTO websites are technologically advanced in every way and are far superior to any other free service offered by state or county level school districts.